When Donald Trump decided to recognize Jerusalem as the capital of Israel, everyone knew that he was going to get a tremendous amount of criticism from the rest of the world. In fact, things got so crazy that even the Pope was criticizing him. But in Israel, Trump is now regarded as a national hero. 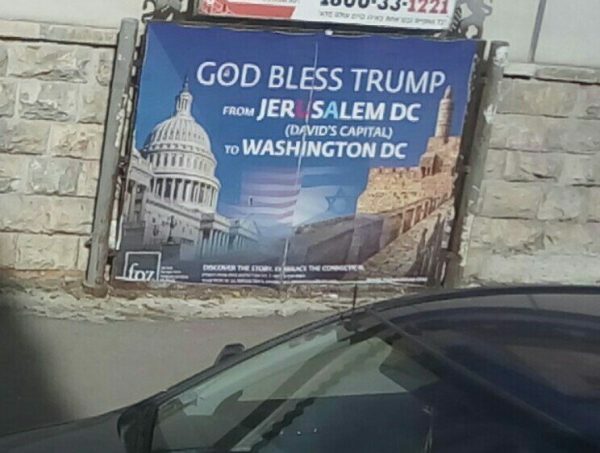 Large signs with the message “God Bless Trump” have gone up all around Jerusalem, and now we have learned that a new train station that will be constructed very close to the Western Wall will actually be named after Trump. A train station that will be built next to the Western Wall will be named after US President Donald Trump. That is truly a tremendous honor. Normally, you would expect permanent landmarks to only be named after great national leaders. Here in the United States, there are a few landmarks and monuments named after foreign leaders, but not too many. So, for Trump to get this kind of recognition in such a historic area of Jerusalem just shows how much his recent decision meant to the Jewish people. Of course, it is going to take quite a bit of time before this train station is actually built. Current plans call for a 3-kilometer tunnel to be built under Jerusalem, and any sort of construction that takes place underneath the holy city inevitably ends up being quite complicated. Yediot Aharonot reported on Tuesday that Katz approved the construction plans for the train, that will include a 3 km. tunnel from the Umma (nation) station at the entrance to the city to the Cardo in the Jewish Quarter. Katz said that he sees the project of extending the length of the railway from Tel Aviv to Jerusalem as the most important national project, and ordered officials in the Transportation Ministry to define it as a top priority mission. As I wrote about yesterday, the UN General Assembly recently voted 128 to 9 against Donald Trump’s recognition of Jerusalem as the capital of Israel. Of course, that vote has no sort of legal significance, and the Trump administration is warning that the countries that voted against the U.S. may see their foreign aid reduced. But another thing that Trump’s decision has done is to embolden other nations that would also like to recognize Jerusalem as the capital of Israel. Trump’s decision to recognize Jerusalem as the capital of Israel was one of the most historic things to happen in the Middle East in decades, and Trump’s popularity in the land of Abraham, Isaac and Jacob is now off the charts. In fact, it is being reported that “God Bless Trump” signs have been going up in major cities all across the country. And other historic events have been taking place in Israel lately as well. A scene straight from the Temple of Solomon was recreated on Tuesday evening when Kohanim lit the menorah, but even more wondrous than this sight was the fragrance that accompanied the event: for the first time in 2,000 years, incense was burned in the Biblically prescribed manner. The Temple reenactment took place in the Gan Tekuma park adjacent to the Jewish Quarter inside of Jerusalem’s old city walls at 5:00 PM, just after sunset. The Kohanim (Jewish men of priestly descent) were dressed in priestly garments as described in the Bible. We are seeing things happen in the land of Israel that a whole lot of people never thought that we would see, and many believe that the pace of significant events will pick up even more as we head into 2018. But as jubilant as people are right now, they need to understand that conflict is on the horizon and that war could erupt in the Middle East at literally any moment.